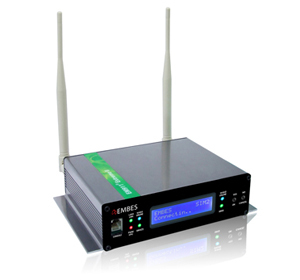 EM911 Extreme II – EMBES Technology (Thailand) Co.,Ltd. Rather than an impressive speed of data rates, iConneXt can also switch work mode to Load Balancing Policy by separating two connections line for two differentiate networks for backup each other and the Load Balancing mode is operated with FULL Redundancy Network Policy which means you would reduce the percentage of downtime as much as possible in designing and managing your network. However, FULL Redundancy Network Policy depends on which Protocol you select in major factor, for instance if you choose to use NAT Protocol with iConneXt, the switching between the two networks can be completed in only 1-2 seconds. Other type of Protocol involves creating Tunnel or Data Encryption resulting in high security such as GRE Tunnel or IPSec which would consider one significant factor, Host Network. Its role is to collaboration the work with iConneXt and it needsto be flexible in order to switch between the two networks with shortest time, normally between 10-15 seconds. As for Port Interface, EM911 Extreme II’s strength is the provision of two LAN ports which enable to divide Segment for increase the level of security of your data. In addition, you can benefit from LAN Port #2 by connecting with Wireline Network such as xDSL and Satellite. This can be easily accommodated because iConneXt will choose which network suits your network the best. You can easily configure individual devices through Standard web based configuration and many devices through iConneXt Manager, intelligent remote device management software that provides easy setup, configuration, reporting and monitoring for large installations. Also, you can proactively monitor for problem devices including excessive data usage, signal strange problem and upgrade thousand devices easily. EM911® Extreme II can achieve other abilities and qualities according to regular standard for high performance Router. The hardware based has designed on embedded system rules that use low power consumption and industrial design so that can be used in the extreme environment including the software design that concerns data sucurity certified by nationwide standard while still maintaining its flexibility during performance. Therefore, you can benefit from EM911® Extreme II and iConneXt to use with the wide range of applications that use Ethernet Protocol and also Serial Protocol in a form of Serial Server. Some of the examples are ATM Machine, EDC Terminal, Data Logger, Data Transferring between Headquarter and Branch, Retail/POS sites, remote printer, new construction locations, temporary office, industrial automation, traffic management, medical, video surveillance, vending machine and much more. 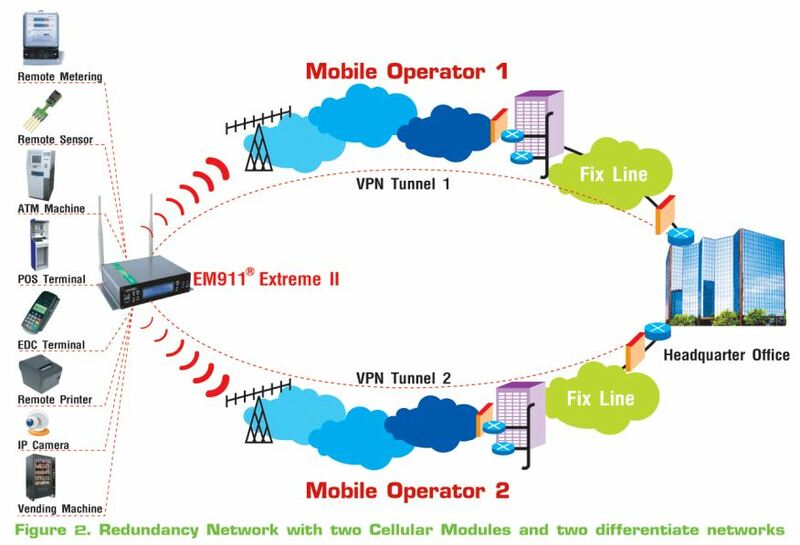 As a conclusion, EM911® Extreme II’s and iConneXt intelligence can generate new vision to help you decide and choose Wireless WAN Cellular Network that is fully qualified with stability, data security, speed, and high flexibility. Today, you can be confident selecting Wireless WAN Cellular Network as your primary network and backup simultaneously in the same piece of equipment.